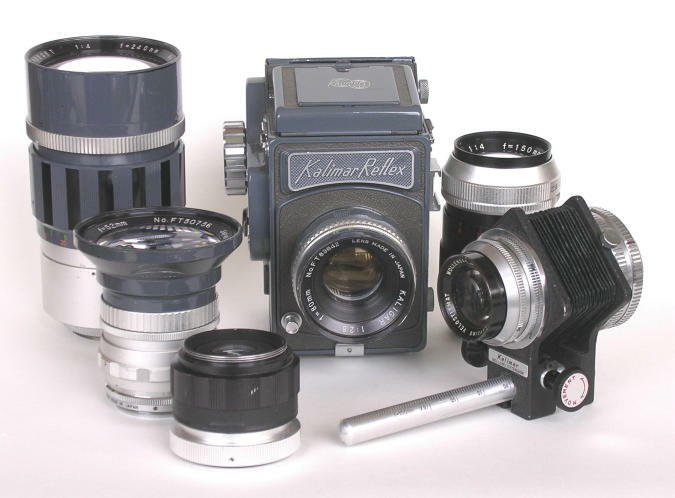 My first medium format SLR was this Kalimar Reflex SQ, dating from about 1960. I got it basically because I could afford it, but it does have some interesting virtues. Notably, it was among the first medium format cameras with an instant-return mirror, and its 52mm wide angle lens was the first retrofocus design for medium format and the widest lens available in its day. Shown with the camera here are the 240/4.0 tele with external diaphragm automation (Kalimar was the only make I've seen to offer external lens automation in medium format), the 52/3.5 wide angle, the 150/4.0 short tele and macro bellows with a Wollensak Enlarging Raptar lens mounted. Only one other lens, a 300mm telephoto, was made for the Kalimar. In the foreground at left is a 2x teleconverter that I made from a Miranda teleconverter and a Series 6 filter ring. 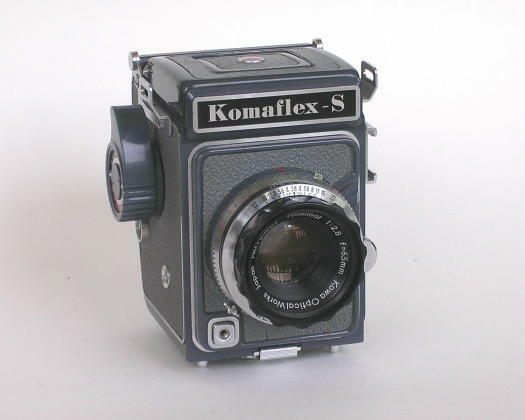 There were a number of TLRs made in the 4x4 cm "super slide" format, but only one SLR: the Komaflex S was introduced in 1960, too late to capitalize on the fad before it faded. The Komaflex has a non-interchangeable 65mm lens in a leaf shutter, and it was, I think, only the second leaf shutter medium format SLR after the Hasselblad 500C. It was made by Kowa, who went on to make the 35mm SETR line and the Kowa Six leaf shuttered SLRs in later years. The Praktisix was introduced by KW, the same people who launched the revolutionary Praktina at about the same time in the mid-1950s, and it shared many of the Praktina's design details and advanced features. It was the first medium format SLR with an automatic lens diaphragm, and the first with an eye level prism viewfinder. 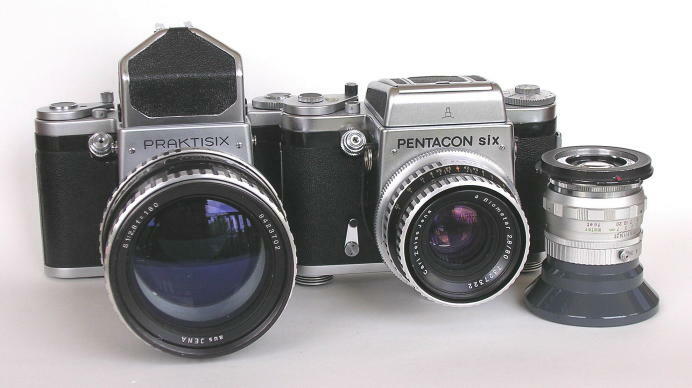 The Praktisix evolved through stages of increasing sophistication and (unfortunately) complexity through the Praktisix II and ultimately to the Pentacon Six. The mechanical frame spacing system of the latter, while more precise when working well, can be troublesome. 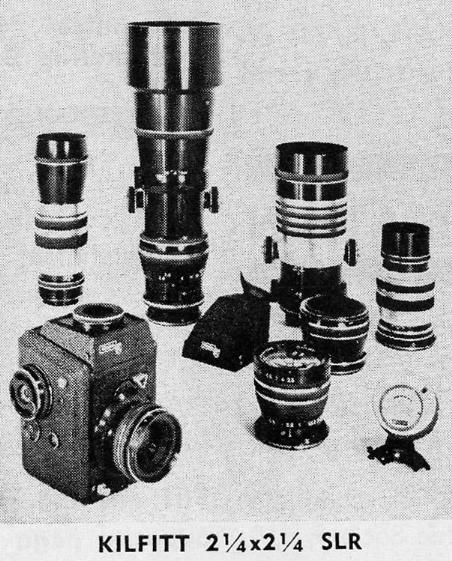 Lenses for these cameras, after an initial misguided fling with Meyer Primotars and Tessars, became uniformly excellent once the Biometar became the standard lens. Shown here are the 180mm f/2.8 Zeiss Sonnar on the Praktisix, and the 80mm f/2.8 Biometar on the Pentacon. At the right is the 52mm f/3.5 wide angle from the Kalimar, in a mount adaptor that I made in my basement to fit it to the P-Sixes.